Slip through the monochrome lobby of the Mystic Hotel, ascend a narrow staircase, and you'll find Burritt Room, a 1920s-style lounge with plush velvet couches and vintage chandeliers. With a prime location in Union Square, Burritt Room draws date-night couples and tourists on romantic getaways to its tables for two and dark, intimate corners. A handsome illustrated menu allows you to choose your drink not only based on the listed ingredients but a sketch of how it will look. Browse classic cocktails like daiquiris and Vieux Carré or house creations like a whisky sour with pear eau de vie and house cordial, or the complex Death March, a mix of mescal, maraschino liqueur, pineapple and nutmeg bitters. The bar staff will guide you through the choices or you can opt to go off-menu by telling them your liquor of choice and preferred flavors. Bonus: The bar is open till 2am, a welcome late-night refuge in a city where many craft watering holes close at 11pm or midnight. I had one night in San Francisco and happened to be near Union Square, so upon my sister's recommendation I ended up at the Burritt Room to meet some friends. Coming in I had no expectations, but after spending a few hours at the bar I left with a warm and fuzzy feeling about this place. It's dark (so dark that an older couple came in and left because they couldn't read the menu) but that is part of the charm. 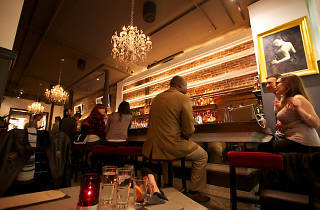 You almost feel transported back in time from the look of the bartenders (20s style) to the wood you're surrounded by. Only the harsh valley girl accents around me broke me out of my spell. I started with the yacht club which was very lemony and refreshing and went back with ease. I could drink those all day. What took me a lot longer to finish was the stronger-than-expected diplomatic immunity, a rummy spiced drink with a slight chocolate/coffee taste. Both drinks were $12 and since they were truly hand-crafted were worth it. To make sure I could survive for a dinner with my sister afterwards I ordered the $16 cheese plate, which, while relatively expensive had a great selection of cheeses and lots of bread/nuts. Easily sharable by a couple people, and not one starving tourist. 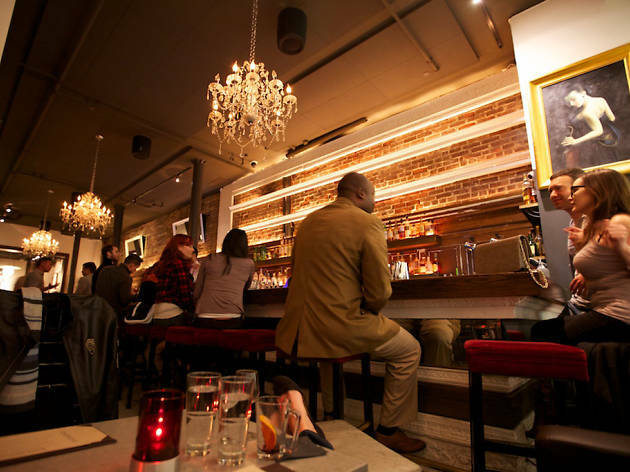 If you like strong, crafted drinks, you'll enjoy your time at Burritt Room.